Sarah Troxell, bar manager of Nobie's, won the 2019 Speed Rack South Central regional competition last night. Photo by Jessica Walters. Nobie’s bar manager Sarah Troxell won last night’s regional South Central Speed Rack competition. The win means that she’ll go on to the national Speed Rack finals held in Chicago. Houston bartenders Sarah Davies of Tiny Boxwoods and Zulco Rodriguez of Anvil Bar & Refuge also competed. Watch the video below by Houston Food Finder writer Josh Armendariz to see her win the first round. The competition started in 2012 and was founded by New York bartenders Ivy Mix and Lynnette Marrero to raise money for breast cancer charities as well as shine the spotlight on other talented female bartenders. The competition is closing in on Mix and Marrero’s original goal of raising a total of 1 million dollars for breast cancer charities. The South Central competition is held in a different major city each year; past host cities include New Orleans, Austin and San Antonio. This year was Houston’s turn in the rotation. Troxell’s win has much to do with perseverance, as this is the third year she competed. In 2017, she placed third in the regional competition. The winner, Elyse Blechman, who at the time worked at Tongue-Cut Sparrow, went on to place second in the nationals that year. Blechman helped mentor Troxell when she went for the prize again in 2018. Sadly, that year Troxell didn’t even place in the top eight. “Last year, I didn’t free-pour the preliminary rounds [as opposed to measuring with jiggers] and most people do. The preliminary round happens before the live event and that’s where I lost last year,” she explained. “So, I really focused on free-pouring for that round. Making the top eight really is the hardest part.” Troxell’s normal methodology in bartending is to measure accurately — which she did during the judged rounds — and probably benefitted from a rule change that added penalties for diluted drinks, temperature and whether the glass is properly full. Needless to say, every year for the past three years, Troxell put in weeks of practice, often inviting friends and Nobie’s customers to join her for practice rounds where they could get four cocktails for $25. 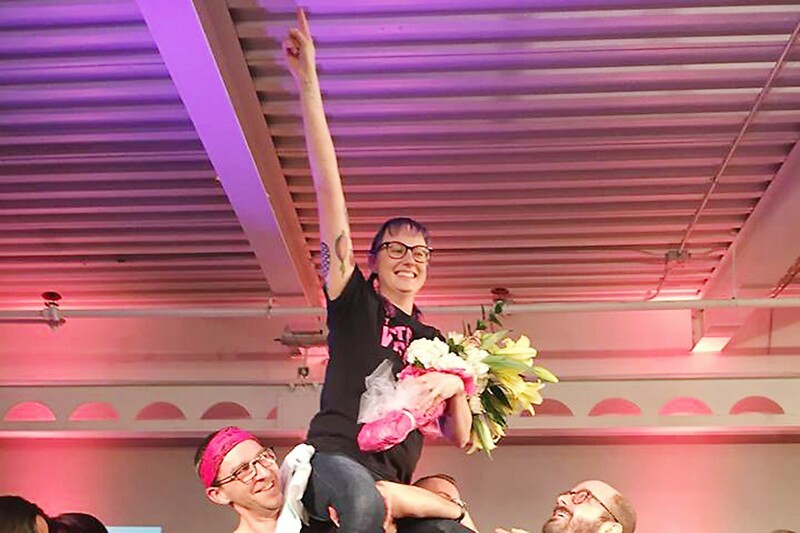 She hosted nine practice sessions to prepare for this year’s Speed Rack competition and often donated her tips to The Rose, a local organization providing breast health options for women in Houston. In a show of support this year, Troxell’s employer Nobie’s shut down for the evening so that everyone there could attend the competition. They weren’t the only ones as many of Troxell’s vocal fans showed up, too. “The moment that sticks out in my head is that before the first round, [the emcee] introduces you and say where you work. The second they said my name, the room erupted. That feeling was almost better than winning Speed Rack. The support this city has shown me is insane and I wouldn’t be doing this without them,” she said. The judges were Tales of the Cocktail executive director Caroline Nabors Rosen, executive chef-owner Chris Shepherd of UB Preserve, One Fifth and Georgia James; 2012 South Central regional winner Alba Huerta of Julep (who went on to place second in nationals that year) and Kam Franklin of nationally recognized Houston band The Suffers. To impress the judges, competitors had to make randomly selected classic cocktails (there’s a list of 60 that they have to memorize) as quickly as possible while still being accurate with measurements and garnishes. The Speed Rack finals are being held in Chicago on May 7 during the Drink Chicago Style cocktail conference. To keep up with new developments, follow the Speed Rack Instagram account. 1/30/19, 11:35 a.m.: article updated to include additional details and comments from Troxell. We watched the Speed Rack competition when it was at Gallery M2 in the Heights! Those women HUSTLED! Congrats to Sarah Troxell, all Houston will be routing for her!